With Facebook forking out $19 billion for WhatsApp, could 2014 be the year when most of us give up on texting and use instant messaging instead? And not just by using WhatsApp; what about SnapChat or Viber? Facebook's purchase of WhatsApp is the company's largest acquisition yet -- much higher than the $1 billion paid for Instagram -- and shows that Mark Zuckerberg wants to be a major player in the huge mobile messaging market. Last month, international consultancy Deloitte predicted that this year will see instant messaging services on mobile phones (MIM) carry over twice the volume of text messaging (SMS) to the tune of 50 billion MIMs against 21 billion SMSs per day. In U.K., roughly 300 billion instant messages will be sent in 2014, versus 140 billion straight-forward texts, Deloitte predicted. Last year was a milestone for the SMS in the U.K.: it was the first time that there was a decline in the number of messages sent. According to Facebook's filing with the U.S. Securities and Exchange Commission, 70 percent of WhatsApp's over 450 million monthly users are active on a single day and 1 million download the app every day. Facebook also claimed that the messaging volume of WhatsApp was "approaching the entire global telecom SMS volume." Paul Lee, the head of telecoms research at Deloitte, said, regarding the decline in text volume: "We have reached a tipping point." The U.K. and the U.S. are somewhat behind the rest of Europe when it comes to embracing the instant messaging craze, according to Tero Kuittinen, the vice-president at mobile phone operator Alekstra. "The real big declines in SMS volumes started in the Netherlands and Spain over two years ago, so you have a couple of European markets where SMS messaging peaked a while back, and now you have the rest of the European countries following the same curve a little bit later," Kuittinen told CNBC. Mobile analyst company Asymco noted that text messaging revenues peaked in Spain at the end of 2008, at around 450 million euros per quarter. They then fell by 60 percent to around 171 million euros spent on texting in the third quarter of 2012. Horace Dediu, the founder of Asymco, said that while many analysts are predicting the decline of SMS over the next few years, "The data from Spain suggests that the drop may happen more quickly than anticipated." "Those countries where the messaging apps really took off were countries where text messaging was relatively expensive," Kuittinen added. "You know text messaging has been relatively cheap in the U.K. so there hasn't been a big pressure on consumers to switch." Furthermore, in the U.S., customers do not have an option like in parts of Europe to opt out of texting, as Kuittinen argued that large networks like AT&T and Verizon bundled text messaging into there large packages, in order to "start protecting themselves from the erosion of SMS." According to the International Telecommunication Union (ITU), a specialized United Nations agency, the cost of a SMS message in Spain in 2012 was $0.25, compared to a price of $0.22 in the United States and $0.19 in the U.K. That made Spain the most expensive country, alongside Turkey, out of the 161 surveyed. Regardless of the cost of texting, a big change for mobile this year will be the high-speed so-called fourth generation - or 4G - of mobile networks, which is now available on many products, and at Mobile World Congress (MWC) this year more 4G devices are expected to be announced. As I.T. research firm Gartner outlined recently, 4G will make the availability and speedy of instant messaging much easier. "Consumers' perceptions of their mobile experience map directly to the performance of apps on their device," Gartner wrote in a release. "4G networks provide faster response times, and also much faster upload speeds -- a clear difference with the more limited capabilities of 3G networks." 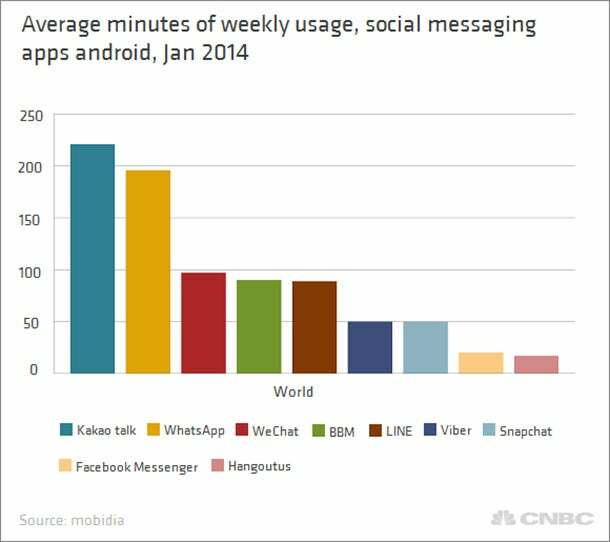 There is already a huge range of messaging apps available, with WhatsApp and SnapChat popular in the U.K. and U.S. These apps' innovative take on messaging - which involve group messaging, gaming, web browsing, even shopping - are what draws people away from traditional text conversations. "Group messaging has been made easy and fun; photo messaging is now an intricate part of it," said Kuittinen. "People now have three or four messaging apps: SnapChat for risky photos, WhatsApp on a professional level. So people have started learning how to mix and match different messaging applications and that's going to be a big trend over the next couple of years." 4G is designed to better handle mobile internet and data, allowing faster and more reliable connections for consumers and thus making access to efficient instant messaging even more attractive to mobile users. Not that there is a definite link between SMS decline and an increase in instant messaging. Deloitte's report stated that, "SMS volumes continue to grow in Germany, where IM penetration is 43 percent. This suggests that SMS and IM will likely coexist, with the balance of penetration and usage varying by country." Anthony Mullen, an analyst at Forrester Research, argued that data is now the key concern for customers, and that IM was the evident winner. "People don't care about the number offree texts any more," he said. "It's how much data can I get for free? I'm surprised it's taken this long for texting to become relegated."